Lyristes plebejus or Tibicen plebejus? Lyristes plebejus is a cicada found in most of Europe and middle-eastern Asia. There is an ongoing debate over its genus. Some say Lyristes, and some say Tibicen. I don’t have an opinion on the matter, but most folks in Europe say Lyristes plebejus, so I’m leading with that name. For more photos of this cicada, visit this gallery of photos by Iván Jesus Torresano García. For more information about this cicada, visit SONGS OF EUROPEAN SINGING CICADAS. Tibicen nigriventris (Walker, 1858) is a cicada found in Mexico and Costa Rico. 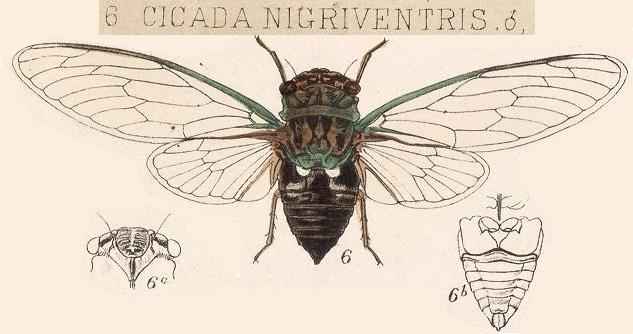 Tibicen nigriventris was formerly known as Cicada nigriventris. The image says Cicada nigriventris, but the newest name of this cicada is Tibicen nigriventris. Tibicen oleacea (Distant, 1891) is a cicada found in Mexico. 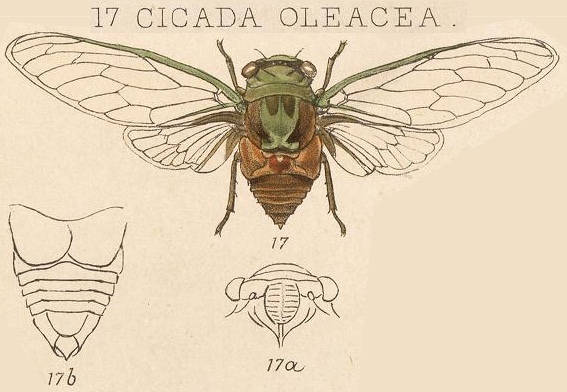 Tibicen oleacea was formerly known as Cicada oleacea and Fidicina oleacea. Photo credit: N. canicularis (Dog-Day cicada) and N. davisi (Southern Dog-Day cicada) by Paul Krombholz. N. superbus by Sloan Childers. Dog-day cicada is the common name given to Tibicen (now Neotibicen) type cicadas in North America. These cicadas are called “Dog Day” because they are typically observed during the “Dog Days of Summer“, which fall somewhere between late July to early September, or once the “Dog Star” Sirius appears in the morning sky. All Neotibicen species are present during the month of August in North America. Here is a list of Neotibicen. Dog-day cicadas are known for their green, brown, black & white coloration that provides them with excellent camouflage in the trees they inhabit. Neotibicen canicularis aka the Dog-day cicada. Canicularis is Latin for “of the dog star”, and the dog star is Sirius. Found in AR, CT, DC, IL, IN, IA, KS, ME, MB, MD, MA, MI, MN, MO, NE, NB, NH, NJ, NY, NC, ND, NS, OH, ON, PA, PE, QC, RI, SC, SD, TN, VT, VA, WV, WI. Season: August-October. Neotibicen davisi, aka the Southern Dog-day cicada. There are two sub-species. Found in AL, DE, DC, FL, GA, LA, MD, MA, MS, NJ, NY, NC, PA, SC, TN, TX, VA, WV. Season: July-October. Neotibicen superbus aka the Superb Dog-day cicada. Found in AR, KS, LA, MO, NM, OK, TX. Season: June-August. Neotibicen auriferus, aka the Plains Dog-day Cicada. Found in AR, KS, MO, NE, NM, OK, TX. Season: July-September. Neotibicen similaris, aka Similar Dog-Day Cicada. Found in AL, FL, GA, LA, MS, NC, SC. Season: June-September. These cicadas do not actually appear the moment Sirius rises, and when they do appear depends on your location and the weather. Neotibicen canicularis will appear in Arkansas before it appears in Quebec. That said, if you are curious when Sirius will rise in your area, search for “heliacal rising of sirius” — it varies about a day per degree of latitude. Neotibicen, depending on the species, can be found from May to December (December in Florida), but all Neotibicen species are present during the month of August in North America. This is my third, and possibly final, article on identifying Neotibicen, using the information on this website. Read the other articles, Identifying Neotibicen and Large Neotibicen (now Megatibicen). Identifying the smaller Neotibicen is no easy task — with two exceptions. 1) Neotibicen superbus, aka the Superb Cicada, because it looks like no other cicada in this group. It is pea green with bright yellow arches on its mesonotum. No other Neotibicen shares that coloration. No other cicada in the group sounds quite like it either. 2) Neotibicen latifasciatus, aka Coastal Scissors Grinder Cicada, because it has a white X (pruinose) on its back. Otherwise, it looks like four other cicadas, kinda like four more, and sounds like three others. While I’ve never heard an actual scissor being sharpened with a grinder, it must sound like the repetitive, rhythmic, short grinding sounds like cicada makes. Grind, Grind, Grind, Grind. Photo by me of Bill Reynolds’ collection. The rest of the small Neotibicen closely resemble each other enough to make many scratch their heads in wonder. BugGuide.net organizes these cicadas into four groups4: the “Green Tibicen Species” (Tibicen is the old genus name for these cicadas), “Southern Dog-day Cicadas”, “Swamp Cicadas”/”The chloromerus Group”, and the “Lyric Cicadas”/”The lyricen Group”. I’ll use these groups for this article for consistency sake. These groups are also closely related genetically1, although Neotibicen similaris, which BugGuide puts under “Southern Dog-day Cicadas”, is a bit of an outlier1. Tables below might be a bit overwhelming — but they help to accurately align the similarities between these cicadas. As you browse this page, if you click the cicada’s name you’ll be brought to a page that features more information about that cicada, including sound files, location information, links to other websites, and often more photos and video. 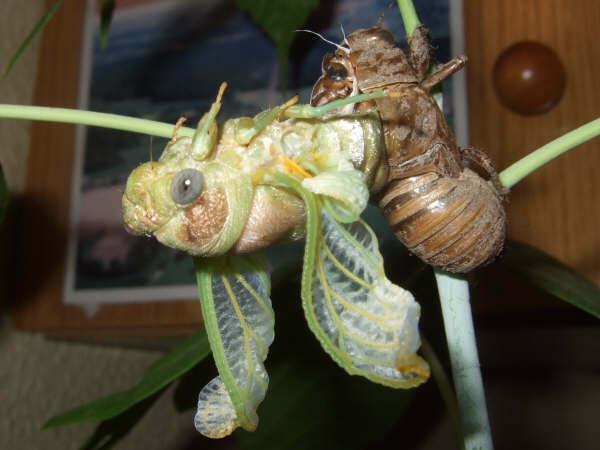 When in doubt: visit the BugGuide Dog Day Cicada page. These Neotibicen all share green markings on their pronotum, mesonotum, and pronotal collars. Find a Neotibicen with a green collar, and there’s a good chance it is one of these. As you can see, these insects are well camouflaged for adult life in trees. Photo credits l to r: Roy Trountman, Tom Lehmkuhl , Paul Krombholz, me. The canicularis varies the most in terms of coloration. Some are very dark, with more black than green, and others have an even amount of green and black. Sounds like an angle grinder tool grinding something. If the cicada has a white X on its back, it is a latifasciatus. Repetitive, rhythmic, call – like someone repeatedly running a scissor over a grinding wheel (I suppose). Known for the bend of their wing. It sounds like the N. tibicen species, but unlike them, it calls from high in the trees. N. pruinosus fulvus Beamer, 1924 aka Yellow morph of Scissor Grinder. This cicada should look like the other cicadas in this table, but its coloring is more yellow than green, like a teneral Scissor Grinder. The Scissor Grinder looks a lot like Linne’s Cicada but their wing doesn’t have the bend that Linne’s Cicada has. The Scissor Grinder also seems to have more of an orange coloration to the “arches” on its mesonotum. Its call is like N. latifasciatus, but it is faster paced. Robinson’s Cicada looks like Linne’s Cicada with less of a wing bend, and a different call. Its call is kind of like N. latifasciatus, but much more raspy. Like the Scissor Grinder, the Eastern Scissor Grinder seems to have more of an orange hue to the arches on its mesonotum, perhaps even more so than the Scissor Grinder. Its call is similar to the Scissor Grinder. Coloration varies from rusty browns to greens. The davisi comes in a wide variety of colors: from rusty browns to greens. Looks like Davis’ Southeastern Dog-Day Cicada but with slight differences in the wings. This cicada is the most unique looking: solid green with prominent yellow arches on its back. Its call is so unique, you’ll have to listen to it and decide what it sounds like. This cicada is similar to the Neotibicen tibicen species in shape (hump back) and coloring. 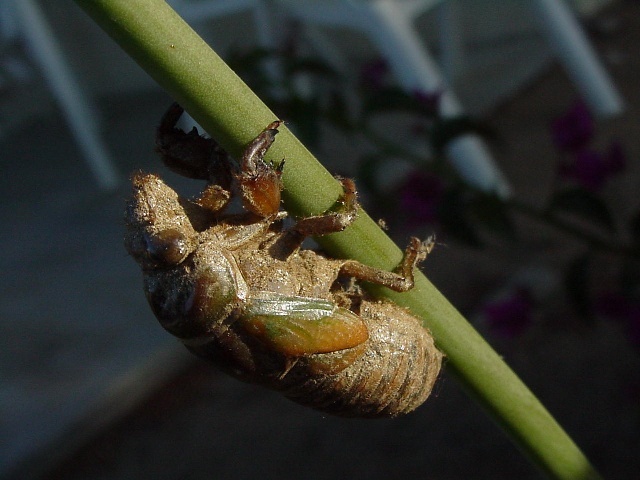 Swamp Cicadas are often the easiest cicadas to find because they prefer to stay in the lower branches of trees. Listen for one, and you’ll likely be able to spot it in the tree above you. Swamp Cicadas are are known for their rounded, humped back. Their coloration varies from mostly black & some green to black, brown and green. Their collar is usually black, but can include green. Its call builds up — a crescendo — peaks, and then fizzles out. Southern Swamp Cicadas look like Swamp Cicadas, but they are more colorful. Their collars are often green & black. 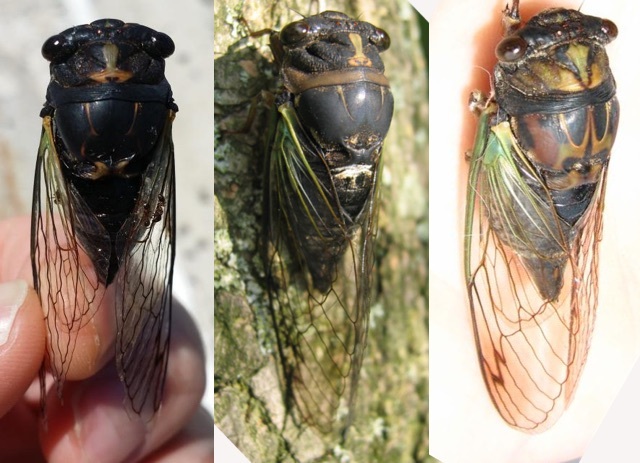 Top: Swamp Cicada; Bottom: Lyric Cicada. 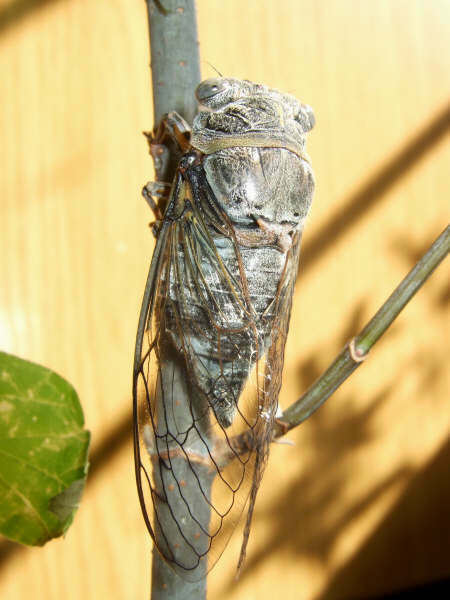 Note the more rounded shape of the Swamp Cicada’s mesonotum, and its green eyes; and the flatter shape of the Lyric cicada’s mesonotum, and its black eyes. Photo by me. The Lyric Cicadas all look physically similar, but their coloration is unique enough to tell them apart. They usually have brown/black collars, which makes it easy to tell them apart from the “Green” Neotibicen. 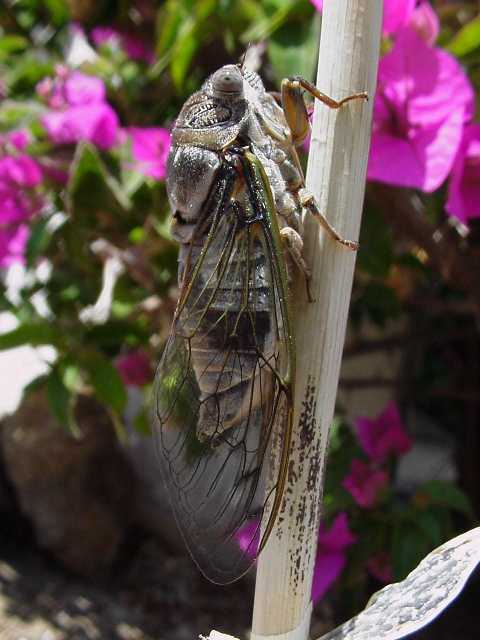 They also resemble the Swamp Cicadas, but Lyric cicadas have flatter mesonotums. Two Dark Lyric Cicadas on Left, and a Lyric Cicada on the Right. Photos L or R: Dan M, Roy Troutman, Dan M.
The Dark Lyric Cicadas have the darkest coloration of all the Lyric cicadas. Their mesonotum is almost entirely dark brown/black. They have a “soda-pop pull-tab” or keyhole shape on their pronotum. Its sound is like an angle grinder tool steadily grinding a slightly uneven surface. The Lyric cicada, like most small Neotibicen, has a green, black & brown camouflage look, but the key is Lyric cicadas typically have black collars. The Coastal Lyric cicadas can be distinguished from other Lyric cicadas by their vibrant turquoise-green colors. 1Molecular phylogenetics, diversification, and systematics of Tibicen Latreille 1825 and allied cicadas of the tribe Cryptotympanini, with three new genera and emphasis on species from the USA and Canada (Hemiptera: Auchenorrhyncha: Cicadidae) by Kathy B. R. Hill, David C. Marshall, Maxwell S. Moulds & Chris Simon. 2015, Zootaxa 3985 (2): 219–251. Link to PDF. 3 Cicadas of the United States and Canada East of the 100th Meridian. 4Bug Guide.net’s Dog Day Cicadas Page. I will update & augment this article over time. The cicada on the Left was found in Middletown NJ, and the cicada on the Right in Metuchen, NJ. Middletown is closer to the ocean than Metuchen is, but both share a similar elevation and vegetation. It is interesting to note the color variation found in Neotibicen tibicen tibicen aka chloromera aka Swamp Cicada aka Hunch-Back cicada. In some areas the dorsal side of N. tibicen tibicen can be almost all black, while in other locations their pronotums & mesonotums feature vibrant greens & rusty browns — you can even make out the “M” on the mesonotum. There may have been cross breeding between the Southern Swamp Cicada (Neotibicen tibicen australis), at some point in time, providing some Neotibicen tibicen tibicen with more colorful appearance. Read Intergrade zones with australis on BudGuide for more information on that possibility.